Daktronics has been selected by Washburn University to provide LED video displays and scoreboards for their basketball venue, Lee Arena, in Topeka, Kansas. The project will be installed in the coming months to elevate the fan experience at basketball and other events held in the venue. 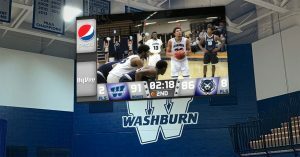 “This will drastically change how we approach our in-game experience within Lee Arena,” says Matt Hutchinson, director of marketing for Washburn University. “We are very fortunate to work with community partners that helped this project become a reality. Two main video displays will be installed in opposite corners of the venue. Each display will measure nearly 9.5 ft. high by 15.5 ft. wide. Each display will feature 6mm line spacing to bring crisp, clear video and graphics to fans throughout the arena. Each display is capable of variable content zoning which allows each to show one large image or to be divided into multiple zones. These zones can then show any combination of live video, instant replays, statistics and game information, graphics and animations, and sponsorship messages. Additionally, a ribbon display will be installed along the seating fascia to bring additional visual elements to every game. It offers the ability to show additional statistics as well as the opportunity to highlight sponsors throughout events. Other technology being installed at Lee Arena includes a fixed-digit basketball scoreboard, two statistics displays, and five locker room clocks. A custom control solution was provided to integrate all of the LED and scoreboard equipment together for a smooth, cohesive event production. Included with the equipment installation, Washburn is also receiving a digital content package to be produced and delivered by Daktronics Creative Services.